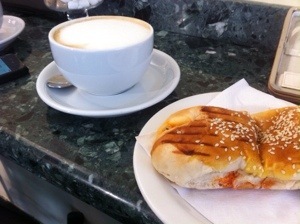 Tzigano’s in Blackheath Village ave opened a deli – we know that won’t be bad, don’t we? Indeed it is crowded full of Italian speakers (some of whom actually proved to be English, but living up to the welcoming “Buon journo!” at the door) clutching goods to themselves and looking furtively about to ensure not missing anything. 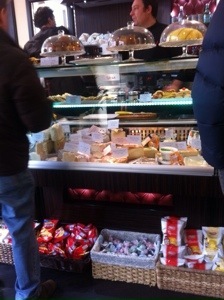 Not missing anything is an achievement, there is a larder selection at the back, a counter of cheeses, one of savouries, a bread corner with a round bread of about the size of my car wheels and the entire top of all the counters is full of cakes… Mmm… Cakes. It is a pity that sitting at the bar puts your back to the cakes, otherwise you could buy a coffee and cake watch all day. We felt it appropriate to start with savouries. There is an advantage in preserving a semblance of sanity, after all. 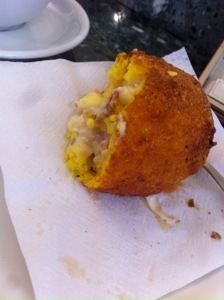 And the savouries, once checked out, proved pretty attractive: there was arancini (one observed Italian speaker turned to us and told us in a native south london accent that they were wonderful), there were breads stuffed with all sorts of delights. Next, serious cake decision making skills had to be engaged. Some choice of that vast untapped supply of sugary delights had to be made. 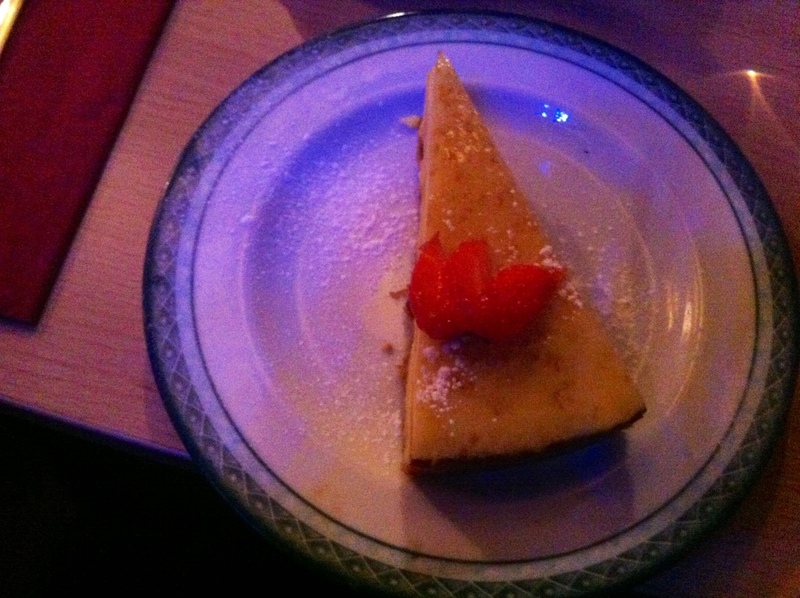 In the end we went traditional (for us) Spanish almond tart. 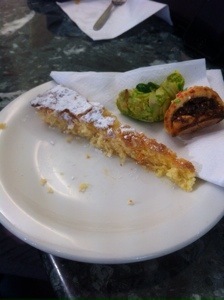 We have a history of good Spanish almond tart. This should be as common as chocolate brownies, (but with better consistency in standard quality than achieved by the contentious brownie). We had fig roll which had a serious crunch and an exceptionally gooey garish green macaroon, referred to by the owner as pasticcino- although when i looked this up, it translated as petit fours, so this does not feel very enlightening. We returned home with olive oil bread. Well… If they don’t take cards, and you have to justify a quick dash over to the barclay’s cashpoint, you may as well make the most of it. 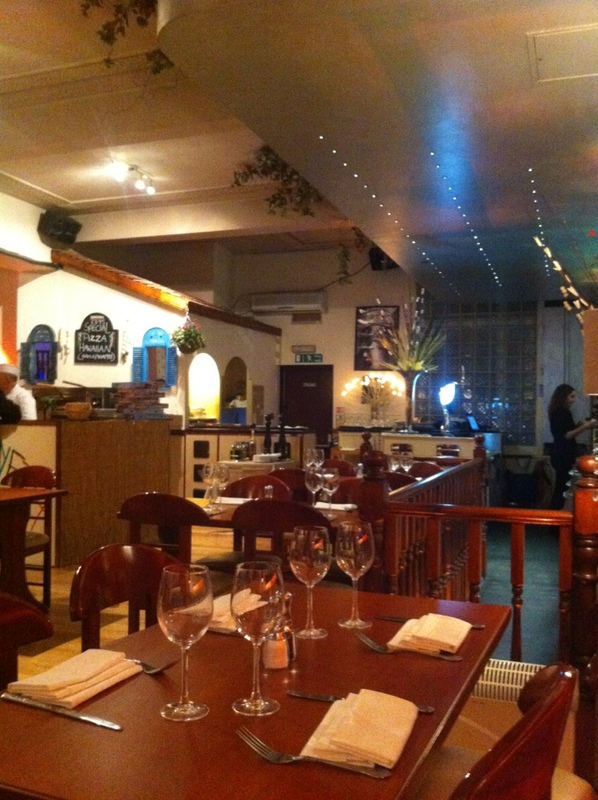 A Review of Venice, Italian Restaurant in Blackheath. 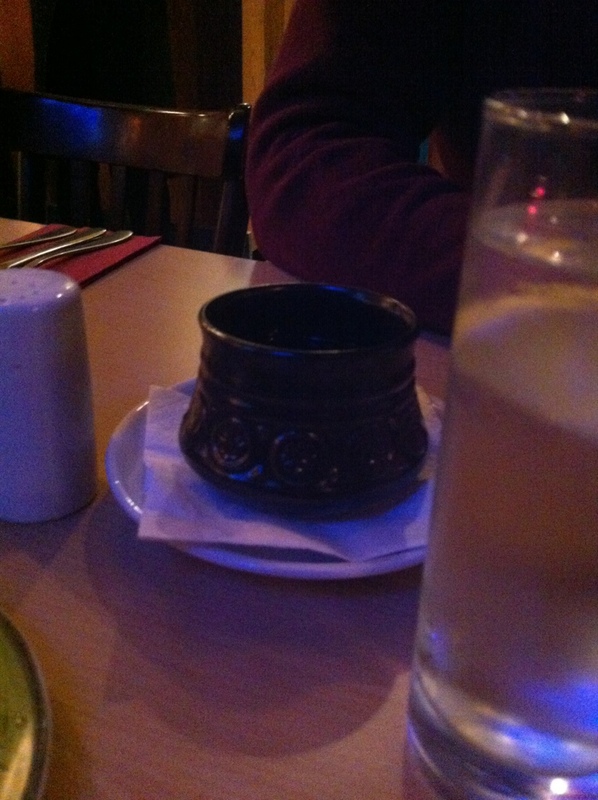 I was drinking peppermint tea in The Railway pub when I thought to myself: I’d like to visit Venice tonight. Now please don’t make the mistake that I made with fellow tweeters of thinking that I mean the second most cannalled city in Europoe (the first being Birmingham. No really. Google it), a mistake so unfortunate it read like a bad joke and attracted a number of “boom booms”… I mean the new Italian restaurant that replaced the other new Italian restaurant, that replaced the Indian, that replaced the Tibetan which replaced Flame Bar… Which I believe (before my time) replaced a Natwest bank. (I may have missed some steps here). Venice was pretty empty. We sat alone amongst the plastic vines desceding from the ceiling. 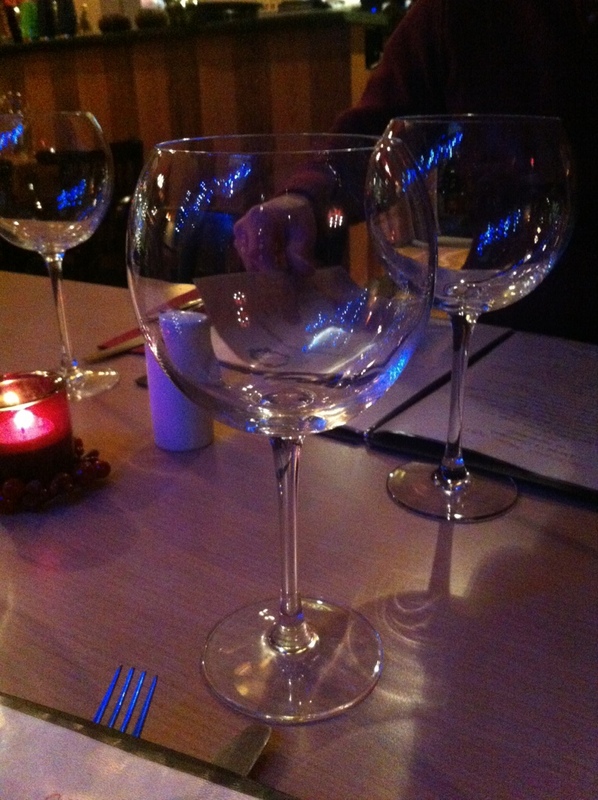 The courses were generously sized. 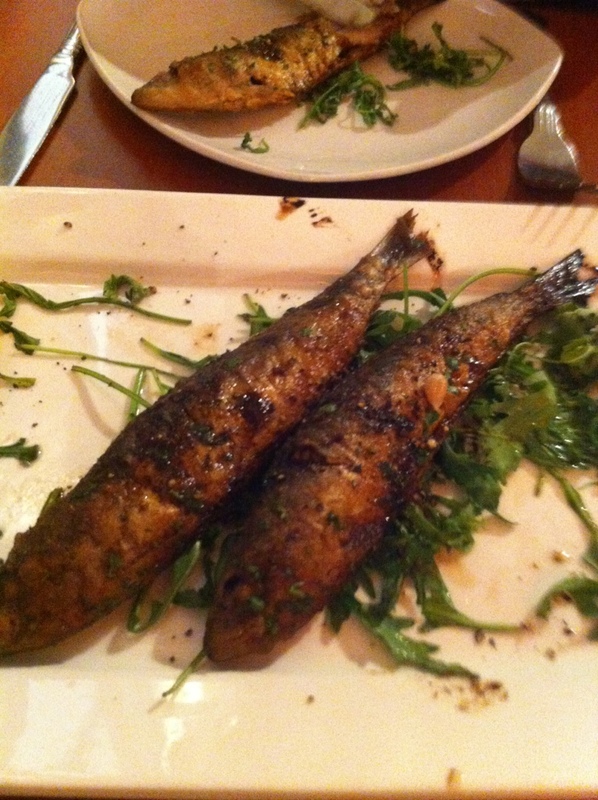 We started with sardines to share…. Of which came 4- nicely mariantated and quite impressive, and made us wonder what was yet to come. 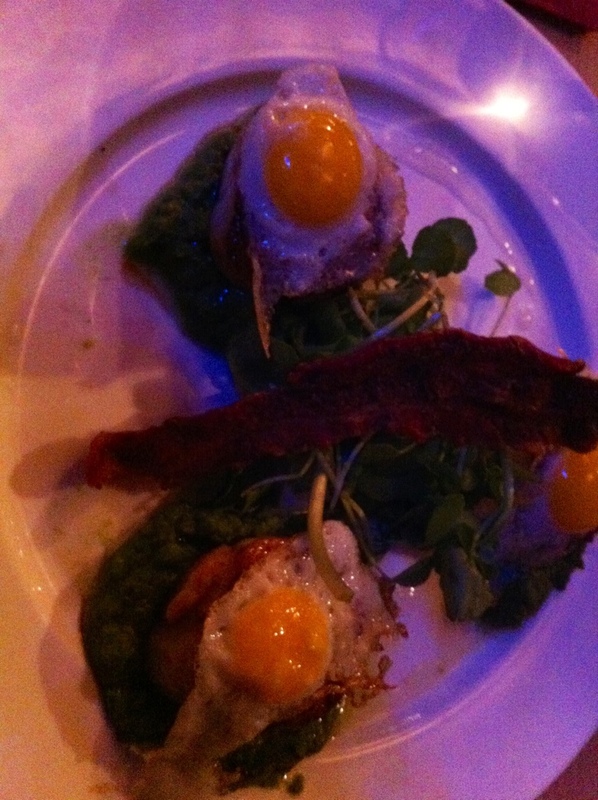 Which was cliffs of pork belly. I do mean cliffs. Take a look. And I would like to add that it was poor perspective on the iPhone that makes the accompanying veg and potatoes look vaguely relative in size. 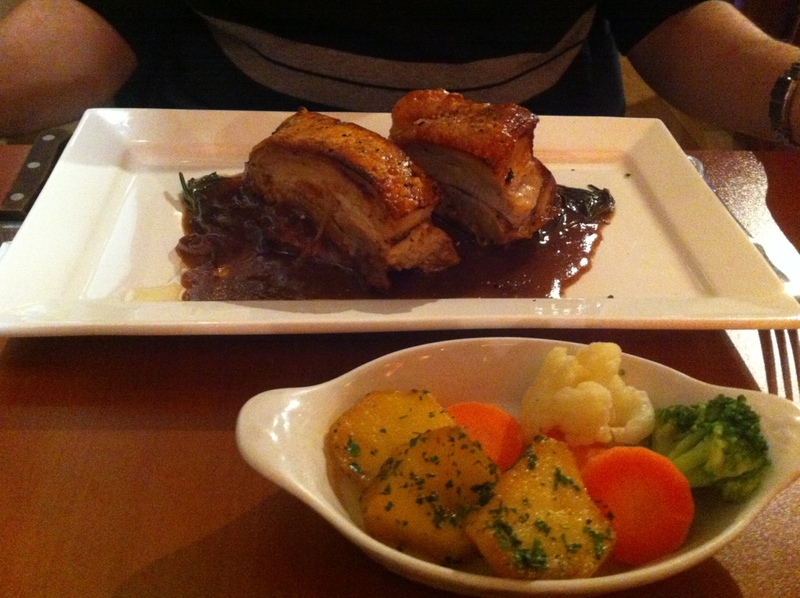 Still, unlike your average penny-squeezing bistro, the sides came free with the mains. So the verdict on the mains is really rather confused: excellent and dull at the same time. 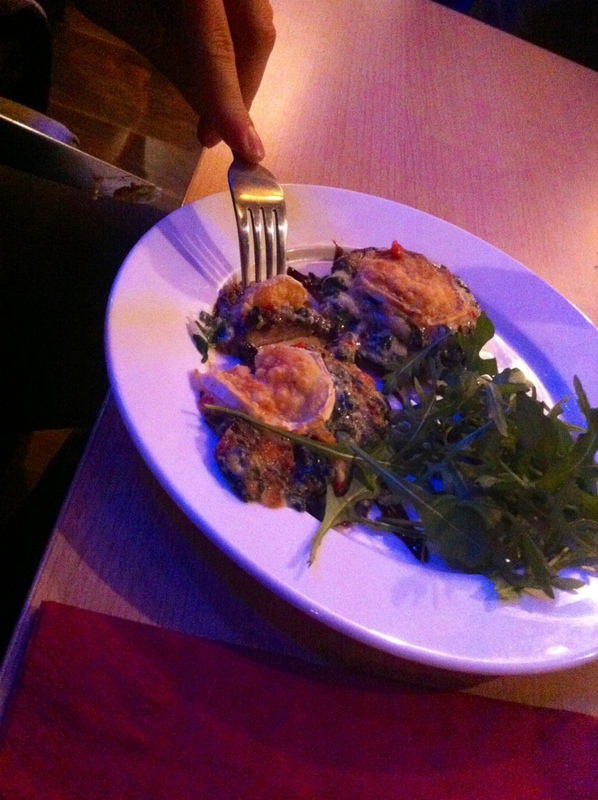 I was chided by the waitress for explaining my feeling on the prawns on invitation, rather than before I had finished. 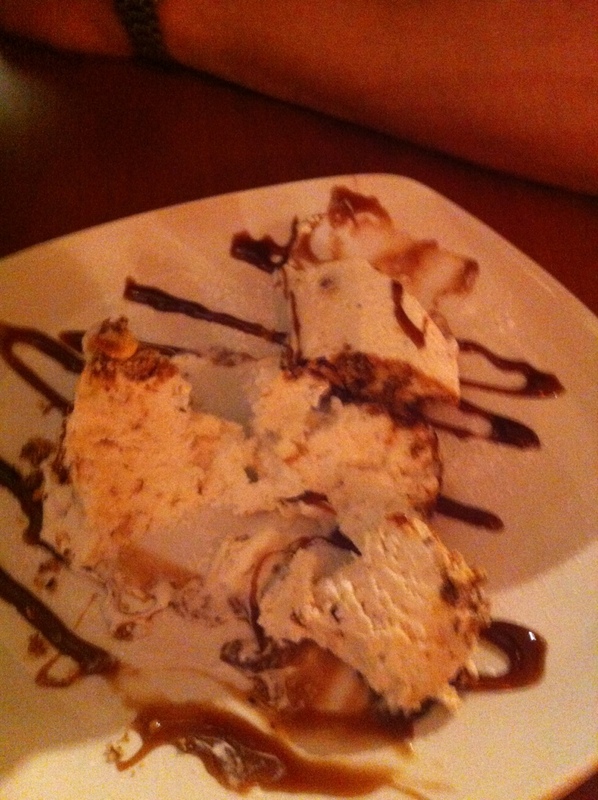 Now I do like Italian desserts. One of my issues with the recent branding of Pizza Express is that it neglects the Italian dessert menu. There were some tempting offerings on the Venice menu, and I spent a while deciding between cannolo and cassata, only to be told they were both out of stock. So was Tartuffe. We were left with profiteroles, tart tatin and treacle sponge. We…ll at least the first 2 were from the same land mass as Italy. 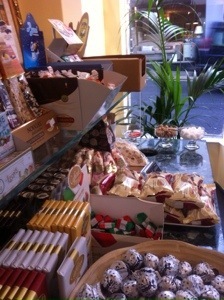 (Although not Sicily where most of the desserts were actually intended to originate from.) Fortunately we were rescued from just having an amaretto shot at home by spotting semi-freddo, but it wasn’t really what we’d had in mind. Service was very friendly, although an inability in to wipe the table after it was pointed out that the dessert menus had landed in gravy was a little cringe-worthy. Does anyone else feel uptight about dessert when they know that forks, elbows and fingers are centimetres from landing in gravy? The pizza man was also very helpful, he was dressed for cooking, rather than waiting and looked a little apprehensive when he noticed we were searching for a coffee when he was the only member of staff left- but met the challenge abley and charmingly, delivering a bitter and rich blend that we much enjoyed. 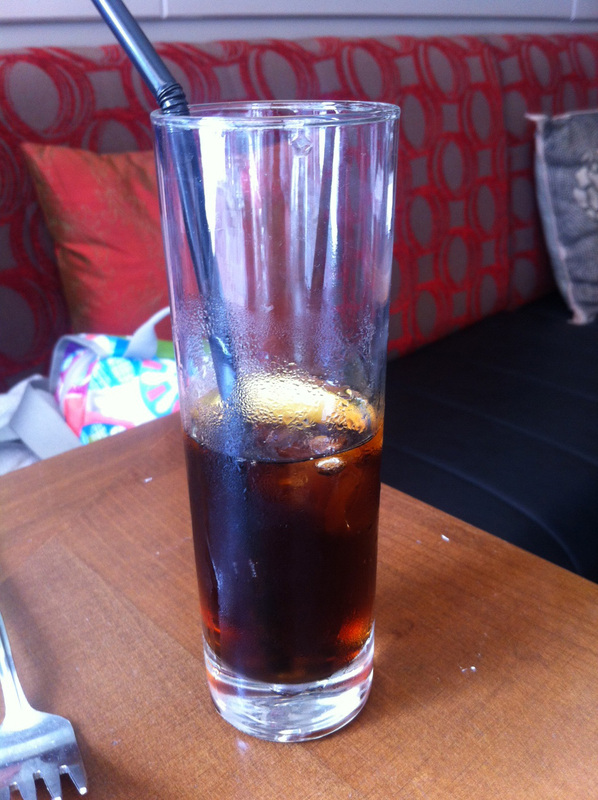 A sophisticated looking glass of coke modelling the Bella Vista Interior. Where do you stand on ordering food where you do not understand every word on the menu? I don’t normally let this bother me, but we found ourselves giving the waitress at Bella Vista the third degree on the meaning of Chicken Involtini. After much intense study of a largely Italian menu, she was stood patiently as we gradually, over the course of half and hour, rejected that option. But I had one major objective at Bella Vista and one only. On our last visit I had found myself gazing enviously at the plates of the competition – er, I mean other diners, who were eating arty pasta dishes, with the accompaniment draped elegantly across the pasta, rather than stirred in. It looked great. Surely it would also taste great. I wanted to know what such an exciting work of art would taste like. I really had to study and understand it, the Mona Lisa of the food world. I focussed. I forced myself to ignore all the other dishes (they were calling out to me). 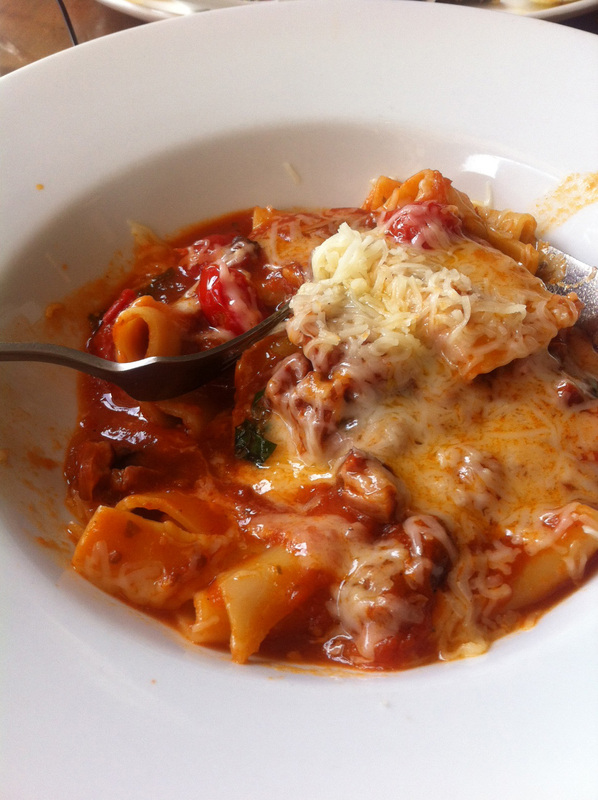 I eventually dived for Paccheri Amatriciana. After all, it featured words ‘giant pasta’ and ‘pancetta and pecorino’ and I have a strange compulsion to order pasta with a balance of meat, vegetable and cheese to maximise enjoyment potential. Also pecorino is pretty fab. Now, this is lovely stringly chewy exciting and with inch sized cubes of pancetta … but not visually brilliant… Not in the way that the competing diner’s dinners were anyway. I could have eaten Involtini, or fish grill. Next time I call ahead. As an aside, I ordered a Gorgonzola, parma ham and figs for a starter. Cheese and figs. Is there anything I can add? In their efforts not to overdress food, the Italians wouldn’t have added a thing. Well, except for the parma ham, and the rocket, umm… and the olive oil..
I’d also recommend frito misto, a fantastic alternative to just plain white bait. 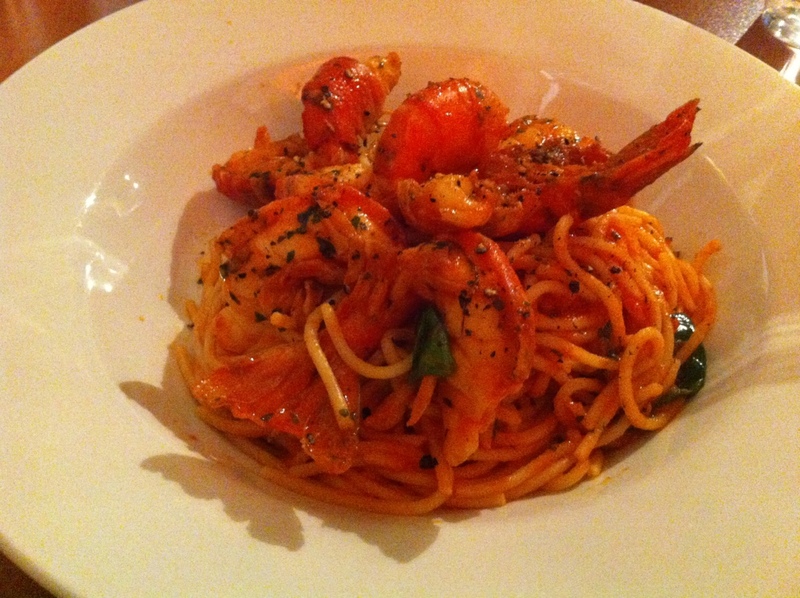 There is much on line about how Bella Vista is authentic home Italian cooking. I have only once experienced home Italian cooking, about 5 years ago, and I only remember the cantuccini and trying to work out the recipe in translated Italian. So I can’t really vouch for this. I could however believe it. The food and menu are actively exciting, albeit not kind to non-Italian speakers. 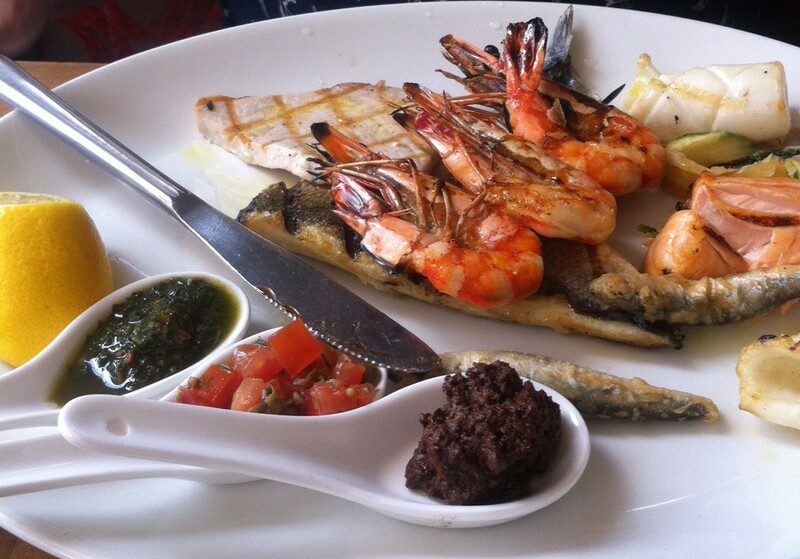 The frito misto is a great twist on just plain whitebait with lemon and salt. 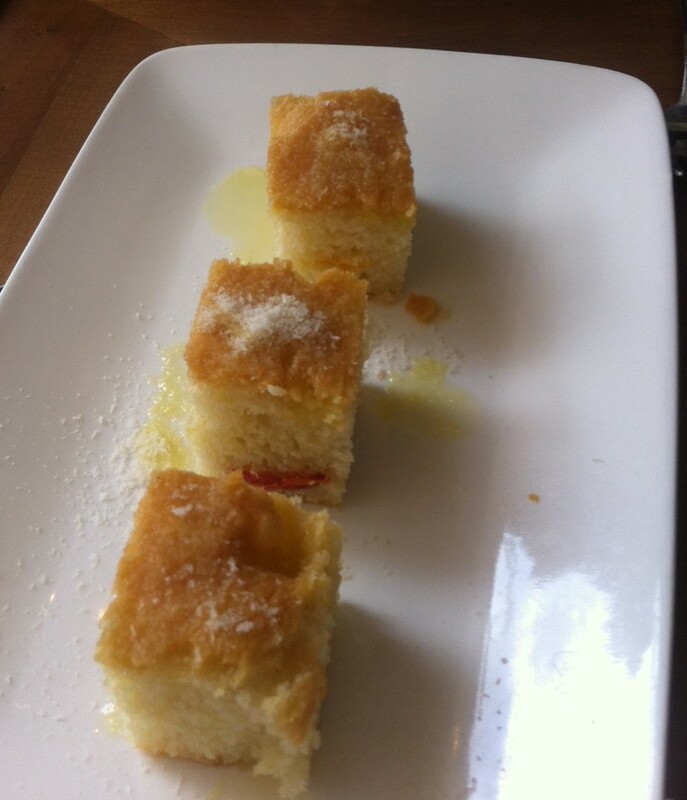 Instead of a bread dish, we received yellow fococcia drizzled in oil, compliments of the chef. I’ll hear none of your ‘jumped up bread wrapped up in words to pretend it’s something special’ lines, thank you very much. 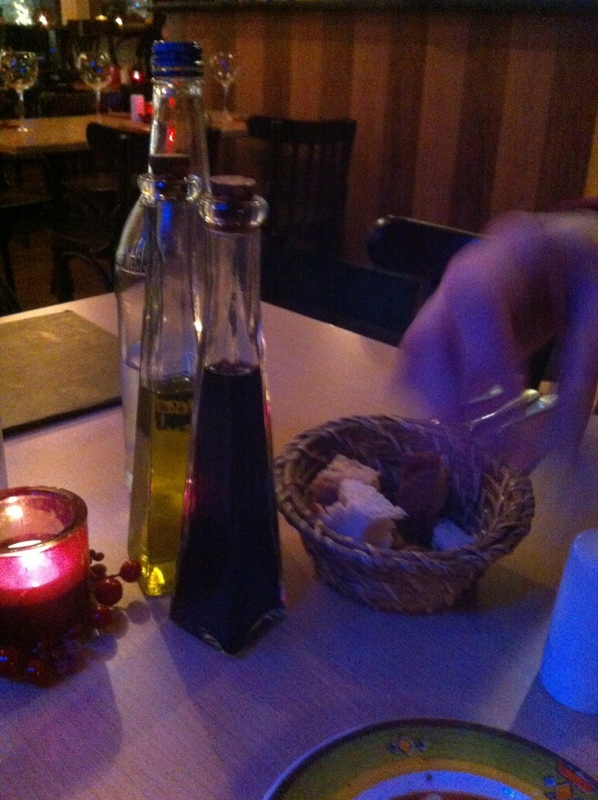 The focaccia had an advantage for being served warm but it was light and not a smidgen too oily. It was shaming really, much better than my personal foccacia attempts. The interior is sophisticated. The addition of campari bottles stacked up upon one another does not assist when I am not a lunchtime drinker. 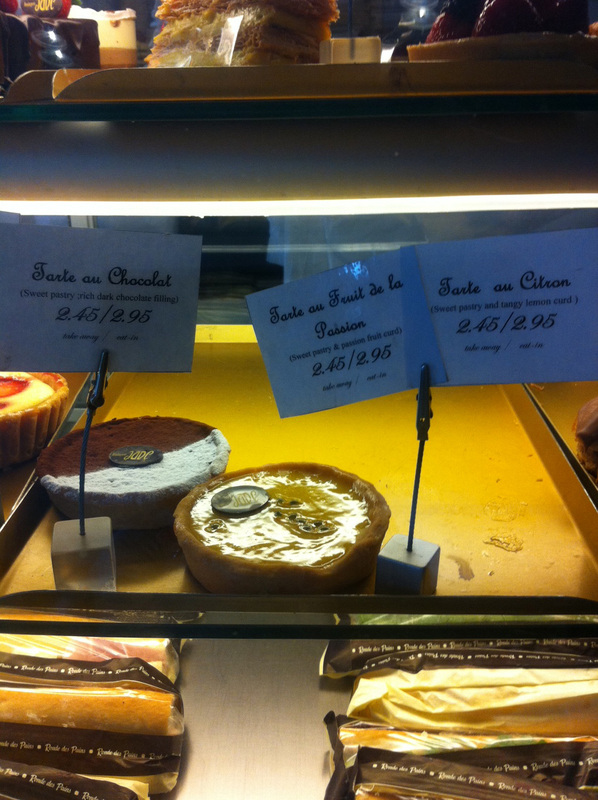 We moved to Boulangerie Jade for dessert, and had the traditional lemon and chocolate tarts, as previously reviewed. The staff were suitably icy. This balanced out the pleasantness of the staff at Bella vista.